The UN Security Council is holding a meeting about North Korea on April 28th. 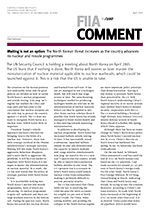 The US fears that if nothing is done, North Korea will sooner or later master the miniaturization of nuclear material applicable to nuclear warheads, which could be launched against it. This is a risk that the US is unable to take.